It is highly unlikely that a health-conscious consumer will check into a room that had smoke owners from the previous guest. Hotel owners and managers are faced with the challenge of juggling some rooms and non-smoking rooms and how to properly and safely convert smoking rooms to non-smoking rooms. Masking agents will not work on cigarette odors and malodors and ozone generators and hydroxy introduce chemicals in the environment that can be harmful to your guest. In addition, the added cost associated with ozone and fogging a room can begin to hurt a hotel’s bottom line throughout the year. Until now, hotels were in the tough predicament of leaving their odorous rooms empty or selling them at rates far below the industry average. Thorough cleanings with chemicals and traditional cleaning products will not eliminate smoke odors, malodors, and neglect odors to name a few. Air, fabric and carpet “fresheners” only hide the smell and do nothing to neutralize the odors and more importantly the chemicals scented fresheners are dangerous for guests and staff with respiratory problems, multiple chemical sensitivities, or asthma. Rather than lose out on revenue with an empty room, hotels can now treat and neutralize the odors with the EnviroKlenz branded product line. EnviroKlenz products are made from safe metal oxides which are in general considered safe compounds that are often found in a variety of safe consumer and food products. EnviroKlenz® products have proven to be highly efficient “destructive adsorbents” for chemicals making them not only competitively advantageous but very attractive in multiple chemical sensitive situations. The EnviroKlenz system approached is broken down into contents, laundry, and indoor air, which provides hotel owners and managers with an affordable and effective DYI solution on remove a broad spectrum of odors from their facilities. The EnviroKlenz Mobile Air System uses an innovative cartridge with patented technology to provide a broad spectrum elimination of environmental pollutants. EnviroKlenz Mobile Air System is effective on a wide range of odors and particulate matter because the patented cartridge is paired with a HEPA filter. 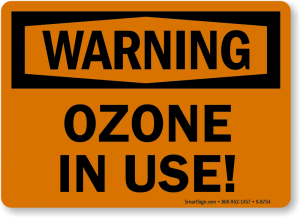 Ozone can be an effective method for eliminating odors and has been used for many years. However, it cannot be operated in occupied spaces. 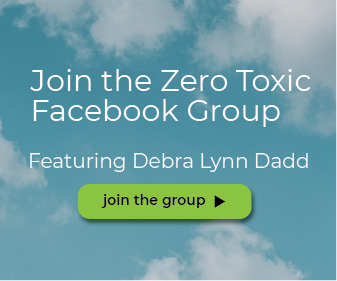 Ozone is considered an air pollutant and has harmful effects on respiratory systems. EnviroKlenz is made with earth friendly materials. The materials inside the cartridge are safe metal oxides. Ozone is an unstable molecule consisting of three oxygen atoms. It is created when UV light hits an oxygen atom. Oxygen (O2) is split into 2 atoms and combines with another for three total (O3). Ozone is a powerful oxidizing agent. It is highly reactive and very quick to chemically react, even with things you don’t want harmed. The extra oxygen atom attaches to other materials, chemically changing the structure into something else and the by-products of these reactions are uncertain and remain present in your environment. 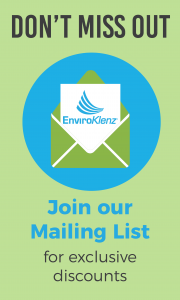 EnviroKlenz is unique when considering all odor elimination systems because it puts nothing into the atmosphere. It draws everything into the cartridge where it is destroyed and will not be released. We say it is “non-invasive” in nature and actually leaves the environment in better condition that it was previously. Ozone molecules are released into the air and surfaces in a room and can leaves behind an odor many find offensive or a nuisance even once the harmful levels have dissipated. 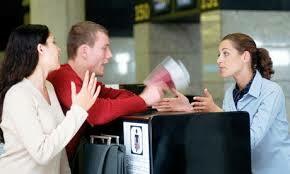 EnviroKlenz removes odors on contact and works much faster than other odor eliminating technologies. When we performed testing in an environmental chamber, EnviroKlenz removed and neutralized a harmful sulfur chemical in less than 15 minutes, whereas Ozone took just under 2 hours and left behind residual chemical odors. An advantage to EnviroKlenz is being able to live and work around it while it is cleaning the air. When using Ozone, it must build up for a period of time until it reaches a high enough concentration to react with the odors, then it must return to a safe level before the space is safe to enter. Removal of hazardous pollutants from the air is an important application area with significant impact on human health and quality of life. 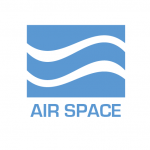 Portable home air filters, personal protection respirators, and large scale filtration systems installed in buildings are examples of air filtration products widely used to improve air quality and prevent exposure to harmful chemicals. 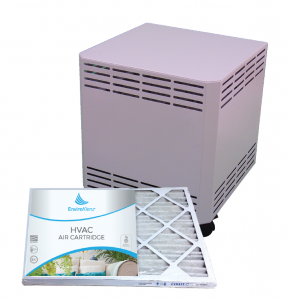 The EnviroKlenz Mobile Air System is your solution to improving your homes air space by removing chemical odors, fragrances, VOCs, and allergens. The unit is portable and once the air cartridge (size 14”x14”x1” nominal) is installed you will begin to remove and neutralize odors in the air. The EnviroKlenz Air Cartridge for HVAC systems eliminates pollutants, odors and corrosive gasses associated with indoor air quality problems without releasing chemicals, fragrances, or masking agents back into the environment. The cartridges install right into your system and treats the air as your system is running and begins to immediately improve indoor air quality the moment installed. 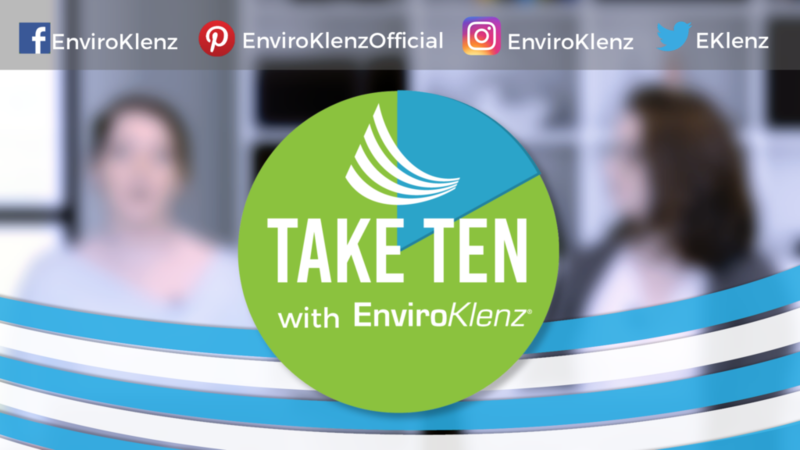 EnviroKlenz Everyday Odor Eliminator can be used on water-safe surfaces and is designed for use on carpets, fabrics and other extractable surfaces that may be harboring chemical odors. It destroys odors deep down, eliminating odors at the source. EnviroKlenz is a specially formulated product to provide maximum neutralization and odor extraction by capturing, destroying, and removing offending odor sources safely and effectively. 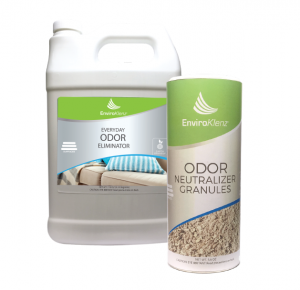 EnviroKlenz Odor Neutralizer Granules helps you clean up chemical/odor spills and messes. The high capacity granule can be used to soak up all sorts of odor spills while simultaneously neutralizing the odor. EnviroKlenz Laundry Enhancer works great on a variety of odors, including the removal of fragrances and tobacco smoke from clothing, dreaded musty odors from towels, and sweat and body odors from all sorts of launderable items. 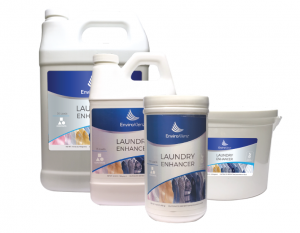 EnviroKlenz Laundry Enhancer offers a simple, safe, and fast odor and fragrance elimination of machine washable fabrics affected by chemical odors. The product is non-bleaching or staining, and most importantly, no masking agents or additional fragrances are added so your laundry will come out clean and fragrance-free.